Andrew Badecker Wins Event #13: $1,500 No-Limit Hold'em Shootout ($369,371)! What started with 1440 people and 160 tables is now just 1 person left with a bracelet. Andrew Badecker had to win a nine-handed table, a ten-handed table and a 16 person sit 'n' go that included the likes of Frank Kassela, David Pham, Dan Kelly, Erik Cajelais, Lars Bonding, and Vitaly Lunkin. 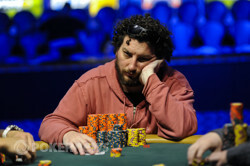 Badecker entered the official final table of nine the chip leader and essentially dominated the whole way. There were a couple points where he lost the chip lead, but he quickly got it back and took down his last table in style, including this hand he played against fellow chip leader Daniel Makowsky when they were all three handed. Preflop, Badecker raised from the small blind to 75,000 and Makowsky re-raised in the big blind to 175,000. The flop came and Badecker led out with a check. Makowsky bet 200,000 and Badecker check-raised to 450,000. Makowski called. The turn came and Badecker bet out for 380,000. Makowsky then announced all in (for a total of 1,600,000) and Badecker quickly called. Badecker flipped over for a flopped flush and Makowsky showed . Once Makowsky called, it was over as he was drawing dead. At that point, Badecker took a three to one chip lead over Robbie Verspui going into heads-up play and never looked back. Although Badecker is our 12th straight first time bracelet winner, it is rare to see such a stacked field in the final 16 of a No-Limit event at the World Series, so we know Badecker can play and that we will see him around again for sure. 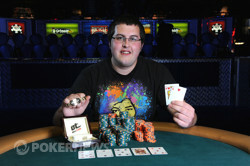 Congratulations Andrew Badecker, you are a World Series of Poker Champion! After check-raising Robbie Verspui off a flop of and then three betting the next hand as well to force the Dutchman to fold, Andrew Badecker raised to 90,000 but Verspui reraised to 245,000. Badecker eyed his opponent's 1.7 million remaining chips or so and moved all in, Verspui snap-called. The flop came and Badecker's friends went wild shouting for his hand to hold. The on the turn improved Badecker's to two pair but Verspui made the nut flush draw. "RED!!" screamed the rail and the river brought the meaning Badecker took home the bracelet. For his part, Robbie Verspui will be disappointed but it'll be tempered by the fact he was the short stack during four handed, but three double ups put him into contention. Nevertheless, it's the best finish by a Dutch player so far but not the fourth bracelet for Holland that he was hoping for. Preflop, Verspui called the big blind, but Badecker raised to 90,000 and Verspui called. The flop was and Andrew Badecker bet 260,000. Robbie Verspui re-raised to 640,000 and then after some thought, Badecker went all in for a total of about 4,000,000. Verspui thought about it and then folded. Badecker is in control with a two and a half to one chip lead. Robbie Verspui limped in and Andrew Badecker made it 120,000 to play, Verspui didn't take long to make this call. The flop was and Badecker bet 110,000 and Verspui made the call before both players checked the turn, the river was the and Badecker checked again, this time Verspui bet 175,000. Badecker sat blinking at the table and then check-raised to 535,000 and Verspui called quickly but couldn't beat his opponent's for rivered trip deuces. Robbie Verspui raised to 100,000 on the button and Andrew Badecker made the call from the big blind. The flop came and Badecker checked. Verspui bet 125,000 and Badecker check-raised to 280,000. Verspui made the call. 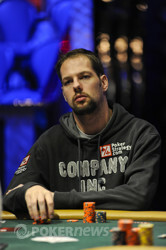 The turn was the and Badecker bet out 545,000 with a call from Verspui. The river was the and both players checked. Verspui showed for a pair of fives and this was enough to beat out the of Badecker and take down the pot. The pot put Verspui almost even in chips with Badecker. The first few pots have gone to Robbie Verspui, picking up one pot with on the river of a after Andrew Badecker made a call of 75,000 on the turn with the river being checked down. Badecker flashed the and mucked. The biggest pot saw Badecker check-call bets of 180,000 and 380,000 on the turn and river of a river only for Verspui to show to pick up the biggest pot so far. 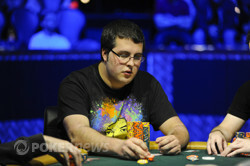 Preflop, Andrew Badecker raised from the small blind to 75,000 and Makowsky re-raised in the big blind to 175,000. The floor is setting up for heads-up play now and the bracelet is on the table.